Software defined network, such as Cisco ACI creates highly automated and programmable infrastructure to help enterprises reduce operational costs. Avi integrates with Cisco APIC controller to deliver L4-L7 application services including firewalls and load balancing. However, today’s complex appliance-based load balancers require IT administrators to manually configure multiple network switches to steer traffic to them. This task is time-consuming and error prone. These hardware ADCs are difficult to automate and deliver self-service experiences to application teams. Modern applications require application delivery infrastructure to automatically scale out the capacity of application services in real time. However, with traditional load balancers, adding extra capacity often means manually adding a new appliance – virtual or physical. Administrators need to spend a lot of time defining complex policies and still lack visibility data such as application latency and performance to guarantee SLAs. Avi Vantage is a software-only Application Delivery Controller (ADC) that integrates Cisco APIC with Avi’s central controller based on a software-defined architecture. Together with Cisco ACI, Avi helps enable Cisco SDN automation using industry’s simplest L4-L7 service insertion for Cisco APIC. The Avi Controller builds a dynamic service fabric by making the Avi Service Engines (load balancers) available to Cisco ACI, on demand. Cisco APIC programs the ACI fabric and communicates with Avi Controller through REST APIs provided by Avi Networks. Avi Vantage provides real-time analytics, application visibility, and elastic application delivery services – such as SSL termination and content acceleration. For Cisco ACI load balancing, the Avi Vantage Platform enables IT teams to quickly roll out network infrastructure and deliver application services in the data center based on centralized policies. 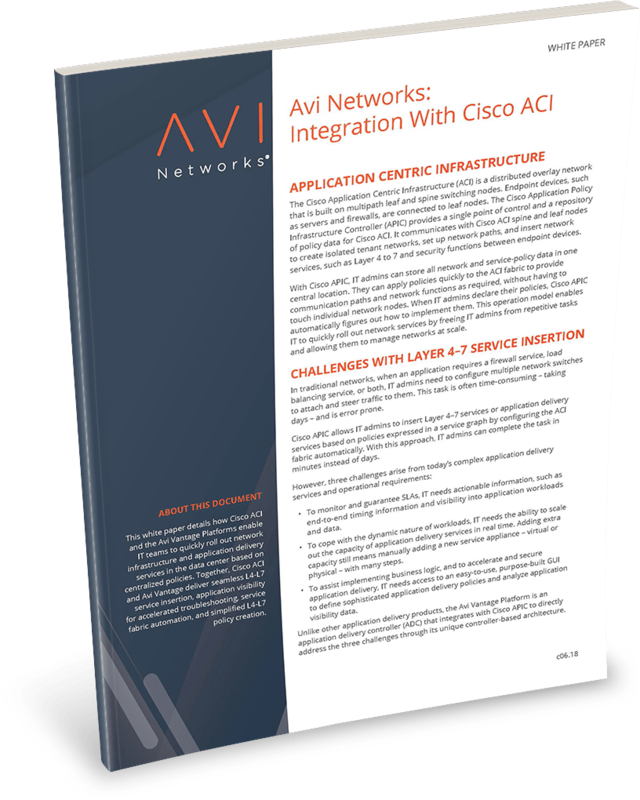 Learn how Avi Networks' Vantage Platform integrates with Cisco ACI to deliver automation, end-to-end application visibility, and more! See how the Avi Vantage Platform and Cisco ACI deliver application services. Leading financial management software firm automates app services.